When people ask me what I do for a living, the answer makes them back off as if I just said I had leprosy. I have come to understand these polite face-twisting reactions. After all, I too took part in the resurgence of stenciling in the 1970s and 1980s. Growing up with parents who ran a shop that specialized in “the restoration of antique illuminating devices” for 32 years, I was quite familiar with the primitive antique world and the stenciling of early Americana. I even designed, cut and stenciled my own antique shop, which eventually lead me to the decorative painting ﬁeld. However, it wasn’t until I was hired to stencil a restaurant built in 1917 that I discovered the wonderful and fabulously different world of Arts and Crafts Stenciling. So let’s get this perfectly clear-when I use the phrase Arts and Crafts stenciling, I am referring to stenciling from the Arts and Crafts Movement; a period of history from about 1900–1925. Some call it Craftsman, others Mission, in my part of the woods many think of it as Prairie School. But it has nothing to do with Popsicle sticks and pompoms. In researching an appropriate stencil for the 1917 restaurant, I was charmed by the movement’s emphasis on simplicity, honesty, and appreciation of nature. Pretty much love at ﬁrst sight, I soon discovered I had a lot to learn. Stenciling was widely used during this period, more than anywhere I had seen before and this Gustav Stickley guy apparently had something to do with it. Gustav and others like him, encouraged homeowners to participate in the decorative arts of their homes and stenciling was a perfect way to do it. Stencils were not only applied to walls–the most common area being in the frieze–but were also used to adorn curtains, table linens and numerous items around the home. Stenciled fabrics were often further embellished with embroidery and although linens can still be found, original wall stenciling has for the most part disappeared and I found the documentation to be minimal. 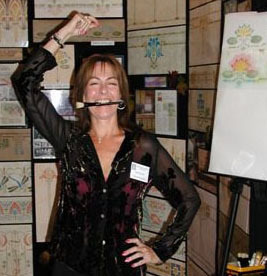 A typical “out of sight, out of mind” situation, stenciling from the Arts and Crafts Movement has all but been forgotten, until now. Fascinated by the beautiful and unusual techniques that were used in stenciling from this period, original examples have offered me a gradual understanding of how the paints were applied by a hand such as mine, many years ago. I document what I can, but alas, they continue to disappear before I can ﬁnd them. So comes the need to pass this on. Over the years, as I have continued to research and document what I have learned about the patterns and unique applications of this marvelous period. 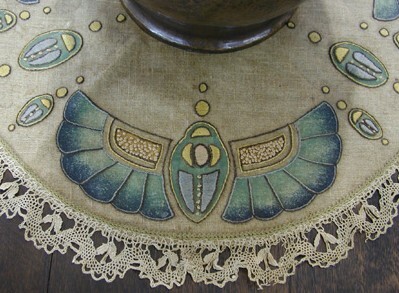 Not only the Craftman style of Arts & Crafts stenciling, but the Art Nouveau, Art Deco and other inﬂuences on it as well. Whether it is simply lecturing on this unique period of stenciling or teaching others how to stencil, it is very rewarding to be able to pass on this chunk of forgotten history. And nothing gives me more pleasure than watching my students depart from a workshop, faces beaming at their accomplishments and rolled up samples tucked under arm, ready to replace the kids artwork on the fridge. My hopes are that I will not only provide you with the encouragement and desire to try your hand at stenciling, but also to help educate you about what sets this beautiful form of stenciling uniquely apart. I offer up a special thanks to Paul Duchscherer, Ann Wallace and all my “show” friends, for their encouragement, guidance and mostly for their friendship, for without, I would not be where I am today. To Gibbs Smith Publishing for boldly taking on my book. To my husband, whose love & “Bonﬁre Therapy” keep me going. And last, but certainly not least, to God, who constantly gives me hope, peace and motivation through the simple beauty and pleasures of His earth around me.